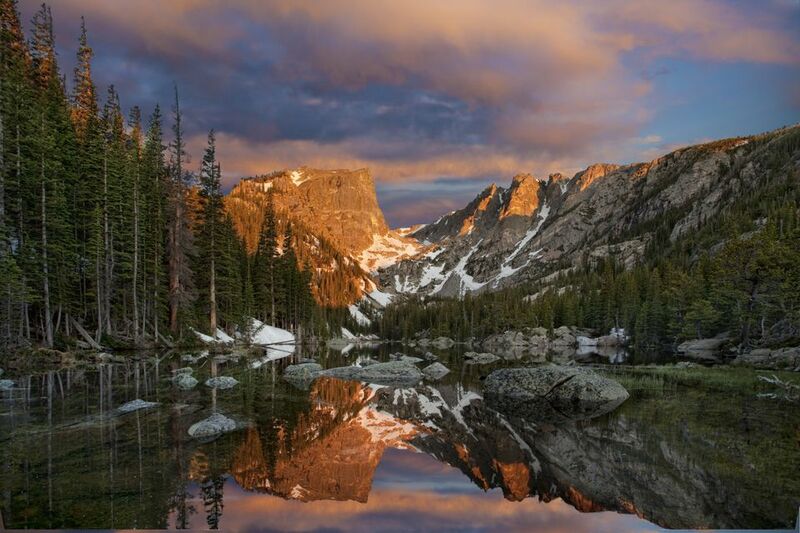 Rocky Mountain National Park may be the most spectacular park in the United States. It's conveniently located near Denver (only 2 hours away) and is full of things to do and beautiful things to see. With massive mountains as a backdrop, tundras of rolling wildflowers, and Alpine lakes, this park is truly stunning. Rocky Mountain National Park was established on January 26, 1915. Wilderness designation was given on December 22, 1980, and the park was designated a Biosphere Reserve in 1976. The park is open year-round but if you want to avoid crowds don't visit between mid-June and mid-August, when the park is busiest. The months of May and June offer great opportunities to view wildflowers. The fall is a beautiful time to visit, especially on sunny September days. The land turns red and gold and offers unbelievable fall foliage viewing. For those seeking winter activities, visit the park for snowshoeing and skiing. Visitor Centers are open at various times during the year. Memorial Day through Labor Day: 9 a.m. to 5 p.m.
For those flying into the area, the closest airport is Denver International Airport. Another option is traveling by train into Granby station. Keep in mind there is no public transportation between the train and the park. From Denver and the east: Take U.S. 34 from Loveland, CO or U.S. 36 from Boulder through Estes Park, CO.
From Denver International Airport: Take Pena Boulevard to Interstate 70 west. Continue on Interstate 70 west until intersecting with Interstate 25 north. (An alternate route from the airport to Interstate 25 is the toll road Interstate 470.) Go north on Interstate 25 to exit number 243 - Colorado Highway 66. Turn west on Highway 66 and go about 16 miles to the town of Lyons. Continue on U.S. Highway 36 all the way to Estes Park, about 22 miles. U.S. Highway 36 intersects with U.S. Highway 34 in Estes Park. Either highway leads to the national park. From west or south: Take Interstate 70 to U.S. 40, then to U.S. 34 in Granby, CO through Grand Lake, CO.
For those visitors entering the park via automobile, there is an entrance fee of $20. The pass is valid for seven days and covers the purchaser and those in the vehicle. For those entering the park by foot, bicycle, moped, or motorcycle, the entrance fee is $10. If you plan on visiting the park many times throughout the year, you may want to consider purchasing the Rocky Mountain National Park Annual Pass. The $60 pass provides unlimited entry to the park for one year from the date of purchase. It’s available at all Rocky Mountain National Park entrance stations, by calling 970-586-1438, or purchasing online. For $50, you can purchase the Rocky Mountain National Park/Arapaho National Recreation Area Annual Pass which provides unlimited entry to both areas for one year from the date of purchase. Available at all Rocky Mountain National Park and Arapaho National Recreation Area entrance stations. Rocky Mountain National Park offers many outdoor activities such as biking, hiking, camping, fishing, horseback riding, backcountry camping, wildlife viewing, scenic drives, and picnicking. There are also many ranger-led programs and even available spaces for weddings. If you have children, learn about the Rocky Mountain Junior Ranger program. Forest Canyon: Check out this glacier-carved valley for a stunning view of the park. Grand Ditch: Built between 1890 and 1932, this ditch was originally created to divert water from the western side of the Continental Divide to the Great Plains of the east. Cub Lake: Take Cub Lake Trail for ample opportunities for birdwatching and wildflower viewing. Long Peak, Chasm Lake: A very popular climb to the park’s tallest peak - Long Peak. The trail to Chasm Lake is slightly less challenging and offers beautiful views. Sprague Lake: A wheelchair accessible trail offering views of Flattop and Hallett. There are five drive-in campgrounds and one drive-in group camping area within the park. Three of the campgrounds--Moraine Park, Glacier Basin, and Aspenglen--take reservations, as does the group-camping area. Other campgrounds are first-come, first-served, and fill quickly during the summer. For those interested in backcountry camping, you must obtain a permit from the Kawuneeche Visitor Center. During the summer, there is a fee to camp. Call (970) 586-1242 for more information. Pets are permitted in the park, however, they are not allowed on trails or in the backcountry. They are allowed only in areas accessed by vehicles, including roadsides, parking areas, picnic areas, and campgrounds. You must keep your pet on a leash no longer than six feet and attended at all times. If you plan on taking long hikes or traveling into the backcountry, you may want to consider pet boarding facilities, which are available in Estes Park and Grand Lake. The Rocky Mountains offer many nearby activities. Roosevelt National Forest is a beautiful place to visit, especially in the fall when the foliage changes. Another option is Dinosaur National Monument, a fun place to check out petroglyphs and fossil-filled cliffs.